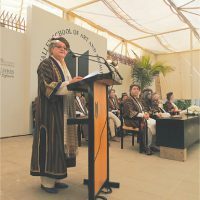 KARACHI: “I don’t know if you have noticed, but perhaps your parents or grandparents have, that there are strange things happening all around us,” said Prof Salima Hashmi while delivering the keynote address on the occasion of the 25th convocation of the Indus Valley School (IVS) of Art and Architecture here on Saturday, where some 109 creative minds with imagination earned their degrees and diplomas. While sharing a cherished memory, she said: “A very long time ago, it was the last century, there was a little girl wearing a pink satin suit, who was entrusted with handing out a pile of books, one at a time, to a room full of people. The book was Dast-i-Saba and it was the work of the poet Faiz. A newly-published collection of poetry written in prison in Hyderabad, not too far from here. “A proud little girl handing out poetry, she didn’t know it was anything special — just a book. But, as people opened it and began to read, the atmosphere became electric. She saw grown men silently weep. Suddenly she knew — here was something special. The words were special. They had flown from behind the high walls that encircled her father. Words were free, and they could be where he could not. Earlier, after observing a minute of silence for former faculty member Javed Haider, who had passed away the night before only, executive director of IVS Samina Raees Khan, in her welcome address, said that before the 109 who were passing out as the historical 25th batch of 2018, there are 1,656 IVS alumni, who are already contributing to and serving as instruments of social change as artists, designers and architects. Of the 109 students, 25 students are from the department of architecture, 10 from the department of interior design, 26 students from the department of communication design, 24 students from the department of textile design and 24 students from the department of fine art. Looking back at the last four years, Ayesha M. Ali, this year’s valedictorian from the department of fine art, said that she had been a medical student before joining IVS. “Art then for me was just to draw well. But here I learnt that art meant conveying messages and to express ourselves by exploring ourselves first,” she said. Later, chairman, board of governors of the IVS, Dr Ishrat Husain congratulated the class of 2018 and their parents for their dedicated efforts that culminated in today’s proud achievements. He mentioned efforts of IVS to become a leading centre of excellence in the field of art, design and architecture and encouraged efforts in promoting a culture of excellence in research and innovation, contributing towards a just and tolerant society and enabling students to serve as instruments of positive change. The convocation ended with the thesis display of the graduating class.